This article is about the part of a building. For the graphical user interface element, see Window (computing). For other uses, see Window (disambiguation) and Windows (disambiguation). Types include the eyebrow window, fixed windows, single-hung and double-hung sash windows, horizontal sliding sash windows, casement windows, awning windows, hopper windows, tilt and slide windows (often door-sized), tilt and turn windows, transom windows, sidelight windows, jalousie or louvered windows, clerestory windows, skylights, roof windows, roof lanterns, bay windows, oriel windows, thermal, or Diocletian, windows, picture windows, emergency exit windows, stained glass windows, French windows, panel windows, and double - and triple paned windows. The English language-word window originates from the Old Norse 'vindauga', from 'vindr – wind' and 'auga – eye', i.e., wind eye. In Norwegian Nynorsk and Icelandic the Old Norse form has survived to this day (in Icelandic only as a less used word for a type of small open "window", not strictly a synonym for gluggi, the Icelandic word for window), in Swedish the word vindöga remains as a term for a hole through the roof of a hut, and in the Danish language 'vindue' and Norwegian Bokmål 'vindu', the direct link to 'eye' is lost, just like for 'window'. 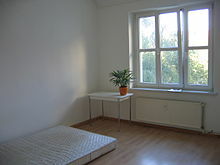 The Danish (but not the Bokmål) word is pronounced fairly similarly to window. 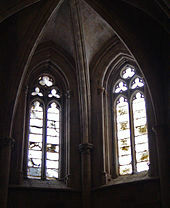 Window is first recorded in the early 13th century, and originally referred to an unglazed hole in a roof. Window replaced the Old English eagþyrl, which literally means 'eye-hole,' and 'eagduru' 'eye-door'. Many Germanic languages however adopted the Latin word 'fenestra' to describe a window with glass, such as standard Swedish 'fönster', or German 'Fenster'. The use of window in English is probably because of the Scandinavian influence on the English language by means of loanwords during the Viking Age. In English the word fenester was used as a parallel until the mid-18th century. Fenestration is still used to describe the arrangement of windows within a façade, as well as defenestration, meaning to throw something out of a window. 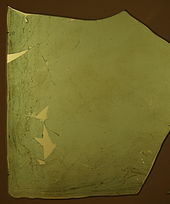 Fragment of a Roman window glass plate dated to 1st to 4th century A.D. Note the obvious curvature, this is not a flat pane. 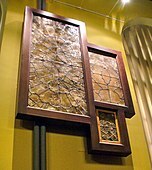 Over the centuries techniques were developed to shear through one side of a blown glass cylinder and produce thinner rectangular window panes from the same amount of glass material. This gave rise to tall narrow windows, usually separated by a vertical support called a mullion. Mullioned glass windows were the windows of choice among European well-to-do, whereas paper windows were economical and widely used in ancient China, Korea and Japan. In England, glass became common in the windows of ordinary homes only in the early 17th century whereas windows made up of panes of flattened animal horn were used as early as the 14th century. A cross-window is a rectangular window usually divided into four lights by a mullion and transom that form a Latin cross. A single-hung sash window is a window that has one sash that is movable (usually the bottom one) and the other fixed. This is the earlier form of sliding sash window, and is also cheaper. A horizontal sliding sash window has two or more sashes that overlap slightly but slide horizontally within the frame. In the UK, these are sometimes called Yorkshire sash windows, presumably because of their traditional use in that county. 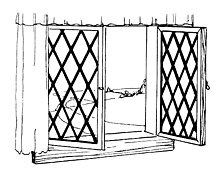 A pivot window is a window hung on one hinge on each of two opposite sides which allows the window to revolve when opened. The hinges may be mounted top and bottom (Vertically Pivoted) or at each jamb (Horizontally Pivoted). The window will usually open initially to a restricted position for ventilation and, once released, fully reverse and lock again for safe cleaning from inside. Modern pivot hinges incorporate a friction device to hold the window open against its own weight and may have restriction and reversed locking built in. In the UK, where this type of window is most common, they were extensively installed in high-rise social housing. A multi-lite window is a window glazed with small panes of glass separated by wooden or lead glazing bars, or muntins, arranged in a decorative glazing pattern often dictated by the building's architectural style. 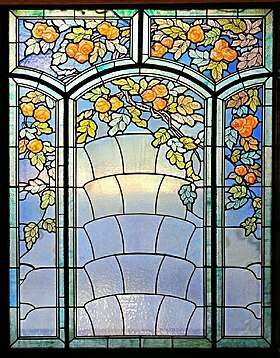 Due to the historic unavailability of large panes of glass, the multi-lit (or lattice window) was the most common window style until the beginning of the 20th century, and is still used in traditional architecture. A "French window" (two French doors on an exterior wall hinged to open outward together without a mullion separating them) at the Embassy of France in Lisbon, early twentieth century. A French door  has two rows of upright rectangular glass panes (lights) extending its full length and two of these doors on an exterior wall and without a mullion separating them, that open outward with opposing hinges to a terrace or porch, are referred to as a French window. Sometimes these are set in pairs or multiples thereof along the exterior wall of a very large room, but often, one French window is placed centrally in a typically-sized room, perhaps among other fixed windows flanking the feature. French windows are known as porte-fenêtre in France and portafinestra in Italy, and frequently are used in modern houses. 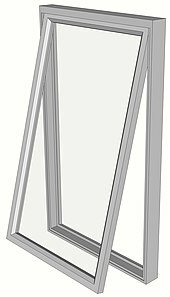 Double-paned windows have two parallel panes (slabs of glass) with a separation of typically about 1 cm; this space is permanently sealed and filled at the time of manufacture with dry air or other dry nonreactive gas. Such windows provide a marked improvement in thermal insulation (and usually in acoustic insulation as well) and are resistant to fogging and frosting caused by temperature differential. They are widely used for residential and commercial construction in intemperate climates. Triple-paned windows have been commercially manufactured and marketed with claims of additional benefit but have not become common. In the UK double-paned and triple-paned are referred to as double-glazing and triple-glazing. Light, or Lite, is the area between the outer parts of a window (transom, sill and jambs), usually filled with a glass pane. Multiple panes are divided by mullions when load-bearing, muntins when not. Replacement window in the United States means a framed window designed to slip inside the original window frame from the inside after the old sashes are removed. In Europe it usually means a complete window including a replacement outer frame. New construction window, in the US, means a window with a nailing fin that is inserted into a rough opening from the outside before applying siding and inside trim. 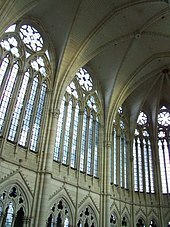 A nailing fin is a projection on the outer frame of the window in the same plane as the glazing, which overlaps the prepared opening, and can thus be 'nailed' into place. In the UK and mainland Europe, windows in new-build houses are usually fixed with long screws into expanding plastic plugs in the brickwork. A gap of up to 13 mm is left around all four sides, and filled with expanding polyurethane foam. This makes the window fixing weatherproof but allows for expansion due to heat. The European harmonised standard hEN 14351-1, which deals with doors and windows, defines 23 characteristics (divided into essential and non essential. Two other, preliminary European Norms that are under development deal with internal pedestrian doors (prEN 14351-2), smoke and fire resisting doors, and openable windows (prEN 16034). Windows can be a significant source of heat transfer. Therefore, insulated glazing units consist of two or more panes to reduce the transfer of heat. These are the pieces of framing that separate a larger window into smaller panes. 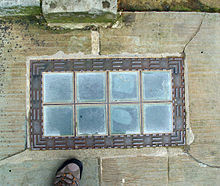 In older windows, large panes of glass were quite expensive, so muntins let smaller panes fill a larger space. In modern windows, light-colored muntins still provide a useful function by reflecting some of the light going through the window, making the window itself a source of diffuse light (instead of just the surfaces and objects illuminated within the room). By increasing the indirect illumination of surfaces near the window, muntins tend to brighten the area immediately around a window and reduce the contrast of shadows within the room. Modern aluminium window frames are typically separated by a thermal break made of a glass fibre reinforced polyamide. With a 34 mm thermal insulation profile it is possible to reach Uf= 1.3 W/m²K for a metal window. This greatly increases thermal resistance, while retaining virtually all of the structural strength. A special class of PVC window frames, uPVC window frames, became widespread since the late 20th century, particularly in Europe: there were 83.5 million installed by 1998 with numbers still growing as of 2012. 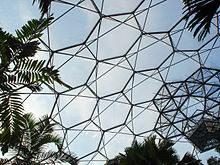 Low-emissivity coated panes reduce heat transfer by radiation, which, depending on which surface is coated, helps prevent heat loss (in cold climates) or heat gains (in warm climates). High thermal resistance can be obtained by evacuating or filling the insulated glazing units with gases such as argon or krypton, which reduces conductive heat transfer due to their low thermal conductivity. Performance of such units depends on good window seals and meticulous frame construction to prevent entry of air and loss of efficiency. Modern double-pane and triple-pane windows often include one or more low-e coatings to reduce the window's U-factor (its insulation value, specifically its rate of heat loss). In general, soft-coat low-e coatings tend to result in a lower solar heat gain coefficient (SHGC) than hard-coat low-e coatings. Modern windows are usually glazed with one large sheet of glass per sash, while windows in the past were glazed with multiple panes separated by glazing bars, or muntins, due to the unavailability of large sheets of glass. Today, glazing bars tend to be decorative, separating windows into small panes of glass even though larger panes of glass are available, generally in a pattern dictated by the architectural style at use. Glazing bars are typically wooden, but occasionally lead glazing bars soldered in place are used for more intricate glazing patterns. Many windows have movable window coverings such as blinds or curtains to keep out light, provide additional insulation, or ensure privacy. Windows allow natural light to enter, but too much can have negative effects such as glare and heat gain. Additionally, while windows let the user see outside, there must be a way to maintain privacy on in the inside. Window coverings are practical accommodations for these issues. Historically, windows are designed with surfaces parallel to vertical building walls. Such a design allows considerable solar light and heat penetration due to the most commonly occurring incidence of sun angles. In passive solar building design, an extended eave is typically used to control the amount of solar light and heat entering the window(s). An alternative method is to calculate an optimum window mounting angle that accounts for summer sun load minimization, with consideration of actual latitude of the building. This process has been implemented, for example, in the Dakin Building in Brisbane, California—in which most of the fenestration is designed to reflect summer heat load and help prevent summer interior over-illumination and glare, by canting windows to nearly a 45 degree angle. Photovoltaic windows not only provide a clear view and illuminate rooms, but also convert sunlight to electricity for the building. In most cases, translucent photovoltaic cells are used. Passive solar windows allow light and solar energy into a building while minimizing air leakage and heat loss. Properly positioning these windows in relation to sun, wind, and landscape—while properly shading them to limit excess heat gain in summer and shoulder seasons, and providing thermal mass to absorb energy during the day and release it when temperatures cool at night—increases comfort and energy efficiency. Properly designed in climates with adequate solar gain, these can even be a building's primary heating system. A window covering is a shade or screen that provides multiple functions. Some coverings, such as drapes and blinds provide occupants with privacy. Some window coverings control solar heat gain and glare. There are external shading devices and internal shading devices. Low-e window film is a low-cost alternative to window replacement to transform existing poorly-insulating windows into energy-efficient windows. For high-rise buildings, smart glass can provide an alternative. ^ a b c d "Window". Britannica. Retrieved May 19, 2012. ^ a b c "Window". The Free Dictionary By Farlex. Retrieved May 19, 2012. ^ "New Oxford American Dictionary". 2010. ^ "Hvaðan kemur orðið gluggi? Af hverju notum við ekki vindauga samanber window?". Vísindavefurinn (in Icelandic). Retrieved September 17, 2018. ^ Langley, Andrew (2011). Medieval Life. Eyewitness. Dorling Kindersley. p. 16. ISBN 1-4053-4545-4. ^ Curl, James Stevens (2006). Oxford Dictionary of Architecture and Landscape Architecture, 2nd ed., OUP, Oxford and New York, p. 214. ISBN 978-0-19-860678-9. ^ Harris, Cyril M.. American architecture: an illustrated encyclopedia. New York: W.W. Norton, 1998. Print. ^ Association), NKBA (National Kitchen and Bath (October 29, 2013). Kitchen & Bath Residential Construction and Systems. John Wiley & Sons. ISBN 9781118711040. ^ Nielson, Karla J. (September 15, 1989). Window Treatments. John Wiley & Sons. p. 45. ISBN 0471289469. ^ Allen, Edward; Thallon, Rob (2011). Fundamentals of Residential Construction (3 ed.). Hoboken, NJ: Wiley. p. 654. ISBN 978-0-470-54083-1. ^ "Will Tilt-and-Turn Windows Gain Market Share in North America? | Window & Door". Windowanddoor.com. March 29, 2010. Retrieved February 11, 2012. ^ Curl, James Stevens. "Flanking window". A dictionary of architecture and landscape architecture. 2nd ed. Oxford England: Oxford University Press, 2006. 285. Print. ^ Sarviel, Ed (1993). Construction Estimating Reference Data. Craftsman Book Company. ISBN 9780934041843. 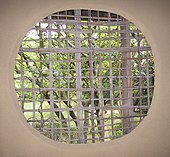 ^ "Picture window". The Free Dictionary By Farlex. Retrieved May 19, 2012. ^ "U.S. Dept. of Transportation: Safety information for bus/motorcoach passengers" (PDF). Retrieved February 11, 2012. 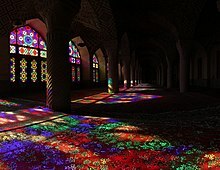 ^ "Stained glass". The Free Dictionary By Farlex. Retrieved May 19, 2012. ^ Brett, Peter (2004). Carpentry and Joinery (2, illustrated ed.). Nelson Thornes. p. 255. ISBN 9780748785025. ^ Carmody, J., Selkowitz, S., Lee, E. S., Arasteh, D., & Willmert, T. (2004). Window Systems for High-Performance Buildings. New York, NY: W. W. Norton & Company, Inc.
^ Pritchard, Geoffrey (1999). Novel and Traditional Fillers for Plastics: Technology and Market Developments. iSmithers Rapra Publishing. p. 95. ISBN 9781859571835. ^ "Global Vinyl Windows Market to Reach 163 Million Units by 2017, According to a New Report by Global Industry Analysts, Inc". PRWeb. April 18, 2012. Retrieved February 11, 2012. ^ Howell, Sandra C. (1976). Designing for the Elderly; Windows. Massachusetts Institute of Technology. Department of Architecture. Design Evaluation Project. ^ "MIT opens new 'window' on solar energy". Web.mit.edu. July 10, 2008. Retrieved February 11, 2012. ^ Beckett, H. E., & Godfrey, J. A. (1974). Windows: Performance, design and installation. 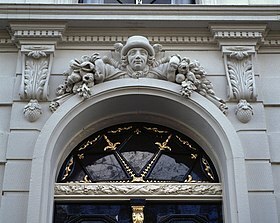 New York, NY: Van Nostrand Reinhold Company. 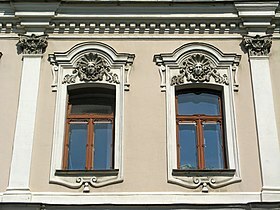 Look up window in Wiktionary, the free dictionary. Wikimedia Commons has media related to Windows.